“First impression is the last impression” not a single person is unknown from the dictum related to image of BJP-PDP parities that make a comic this time everywhere and history will make clear in coming days that both parties played the dirty politics for to remain in power. Would you believe that to regain and get back power in next coming elections both parties determinedly yet played other stroke of energy in theory thought of politics instead of national interest. First democratic form of government entirely fails at every corner to maintain rigidity and the equal satiability in the state. The growing militancy activities, stone pelting in Kashmir valley including heavy loss of armed forces on borders or encounter insurgency cases across the state has been recorded number of times increased more in parallel to past of several years of experience. A student of any class is always familiar with about his or her come back with questionnaire before the declaration of result every time. To learn a new chapter of politics from political leaders at present created scenario is naturally understood for all. The country based political leaders are running several political parties for grow and go up to the power in the country. It is absolutely clear that BJP-PDP alliance form of government was fully aware before bow down about their feat and an action previously has to decide step down unexpectedly. Thus it can’t be ruled out that the both parities BJP-PDP played the double role of politics for political gains by means of consciousness activities of mind to utilize rightly before coming next parliament elections. To put on show the double game for double gains to emphases the future strategy with innovation of new sense of approach in terms of politics in state of Jammu and Kashmir utilize by the both parities is now just call for more attention from the close distance. If truth be told it can’t be ruled out that both alliance parities BJP-PDP in J&K though were fully acknowledged with the facts that the local populace of state is not good turn for them this time and in the eyes of democratic system to breathe on only voting machines is not kind enough for the any political party to stand affirm. 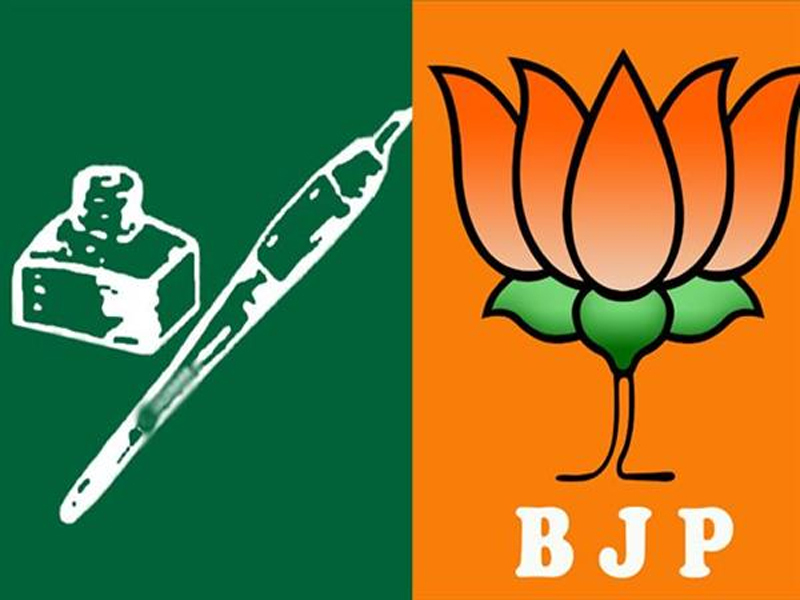 By way of performance much more wicked parties BJP-PDP took the notice in advance before going to hold the customarily elections next year that the people of the kingdom are annoyed for their work outlook, approach and experience. In these stipulations languages finally the black cat came out from the bag unexpectedly recently set a more chance for everyone to make the luminous decision in upcoming elections to be held in next year. Exactly in the name of Hindu tuva the BJP successfully gets 2/3majority with good margin of votes across the country during last elections were to go held smoothly but after party came in power the people of this nation have raised the finger against the BJP and asks that said party has betrayed and deceived the populace in the name of revocation of Article 370 and construction of Ram Temple at Ayodha in Uttarpradesh. Yes the history reveals that the Narsimha Roa ‘government become more victimized in the hands of BJP party on the sensitive issue of abrogation of Article 370 and construction of Ram temple at Ayodya . Several numbers of Hindu youths had received number of injuries in police caning and lathi charge during Ram temple construction struggle campaign in those days. After the party came in power with 2/3 majority instead of remedies both issues were been kept again for to put into practice once again The book of Political theory of thought and its evolution in India by means of election manifesto has been compiled several times by all responsive political parties devoid of came out any positive results till now. That chapter after chapter discussions on stone pelters everyone is already aware that coalition BJP-PDP government had adopted the pleasing attitude in favor of stone pelters in kashmir. The number of stone pelters got rich opportunities in sports and government jobs with the results the stone pelters now being got travelling from the state of Uttar Pradesh or other states to visit Kashmir for participation or throwing stones by adoption theory of tenderer’s. During the reign of BJP-PDP coalition government in the state new innovations and techniques adopted by the wandering youth’s and have promoted stone terrorism sector in the state instead of restoration of normalcy in the state. It has been vividly got noticed during the alliance of BJP- PDP government in Jammu and Kashmir that Security forces has not given free hand to deal with any anti social activities found in speculate Kashmir or other states among the youths. The number of FIR cases been found recognized against security forces during the alliance coalition government. The efforts for abrupt down self-righteous among the army men been done is a matter of grave concern. If you gone through the 3 years work chart of alliance BJP-PDP government you really came to found that populace of Jammu Division become ill fate victim of discrimination in parallel to Kashmir Division badly. The representatives from Kashmir valley from PDP has shown their performance well in practice rather than in Jammu based BJP representatives. More significantly to say here about the facts in connection to resignation of the CM post or unexpectedly step down from the government. The PDP chief patron and former CM Mehbooba mufti make kick starts her election campaign in advance for strengthen her party by making pleasure attitude statements in favor of people of Kashmir Division . In her statement she said that she has not permitted the BJP party to abrogate the Art 370 or interfere in the matter of its own sovereignty state during the whole period of her alliance with BJP. The learned statement of Mehbooba mufti actually arrived from her master father of state” Babai quoom” the former CM Sheikh Mohd Abdullah the father of Dr. farooq Abdullah who after accession successfully got support to run his government in the state of Jammu Kashmir up to his last breathe. While on the other side the BJP has also decided to kick start its campaign for parliamentary elections from Jammu, where the party’s national president Amit Shah will address a rally on June 23,, which is also death anniversary of party ideologue Shayma Prasad Mukherjee who had campaigned for withdrawing J&K’s special constitutional status in the 50s. BJP state president Ravinder Raina and former deputy chief minister Kavinder Gupta told reporters at party headquarters that Shah will arrive in Jammu for a two-day visit. Shah was scheduled to meet party’s MLAs and senior leaders besides intellectuals. But after withdrawing support to PDP, the party has now tasked Shah’s with sounding poll bugle in Jammu. .BJP is gearing up to retain the three Lok Sabha seats, its highest ever tally from the state. As above all these facts enough for everyone to know which is easy understandable for all that both parities PDP and BJP have stepped down in the interest of vested politics rather than in the interest of state. Thus the learned politics from BJP leadership is entirely questionable makes a new chapter readable for all to know as the history will also make clear in coming days that both parties played the dirty politics only for to gain or to remain in power constantly. Thus the question arises here with this stress and pain that” Would stand down politics help BJP-PDP to get back power in J&K?